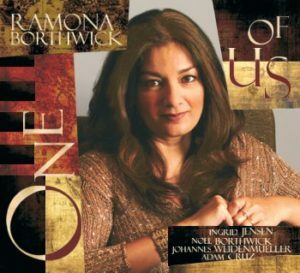 ‘ONE OF US’ is Ramona Borthwick’s latest CD release as a leader. The successor to her well-received debut ‘A New Leaf’, it showcases her evolution as an artist and composer. With a depth that stretches beyond her previous work, the ten compositions on the CD feature Ramona’s distinctive multi-textural writing, piano playing and vocal styles. Stellar performances from trumpet player Ingrid Jensen, guitarist Noel Borthwick, bassist Johannes Weidenmueller and drummer Adam Cruz abound, making this ‘concept’ album a rewarding listener experience. Recorded, mixed and mastered in audiophile format at 24 bit/96 KHz resolution, this production exhibits pristine HD audio quality, capturing every nuance in the performances. P & © 2009 Leitmotif. All Rights Reserved.